Today is Facebook’s IPO and on Hacker News, Techmeme, Twitter, and… Facebook, I can expect all sorts of messages about Facebook new riches, their new mansions, the rising prices of houses in Palo Alto, Menlo Park, SOMA, or Noe Valley! When you are an entrepreneur, giving away stock option is both a source of pride and a source of loss because in your heart, they are worth a lot. Yet few employees actually care about stock options (how much they get, what it means, etc…) when they join you. And should they care about it? In the heydays of the Internet 1.0 bubble, everybody became crazy because of these stock options and hopefully we are not facing similar craziness this time. how many people in the Company (founders included) get a life changing outcome (=make $1M or more). I surveyed people at 10 Companies of different sizes, including Google, Facebook, Pandora, LinkedIn, and a few smaller Companies that got acquired in the 100M+ range, and in the 10M+ range. 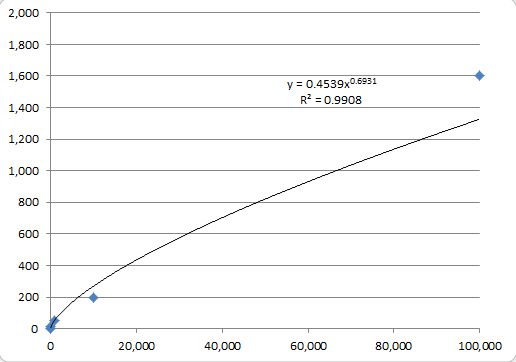 For the Maths buff, a power law:What do you see? You also see that for the once in a decade whale IPOs (like Facebook or Google before them), you can join these Companies pretty late in the game and become a millionaire. For example, you could still join Facebook in 2010, when Facebook had roughly 1200 employees, and be theoretically worth $1M tomorrow morning. And yet, in 2010, few would argue that joining Facebook was a risky proposition. On the other hand, if you look at all Companies that get acquired for less than $1B (which is 99.9% of them), you see that beyond founders and executives, only the first 1-20 employees actually make some money off the sale (Note: this was not true during the first bubble, when Companies went public at a low valuation but grew into very high valuations over time as a Public Company. eBay was a great example of that). The conclusion is that behind the hype, very few non founders/non execs actually make significant money from joining startups, especially if you join beyond the first 20 employees. As entrepreneurs, it re-emphasize our need to create a great place to work, where the stock option upside is really an afterthought. As employees, it shows that beyond anything, working on a great project with people smarter than you is the only thing that matters. And then, you can always be lucky!